I was involved in a car accident in my friend’s car and I think both drivers were at fault. What can I do? My car was totaled in a car accident. Can I keep it? If your car was totaled in a car accident and you want to retain it, you may be able to keep your car and still get paid for your vehicle. If you own your car and are no longer making payments on the vehicle, you will be able to retain your vehicle. The insurance carrier will simply reduce your payment by the salvage value of your car. For example, if your car is worth $10,000 and you are not making any payments on your vehicle, the insurance carrier will owe you $10,000. 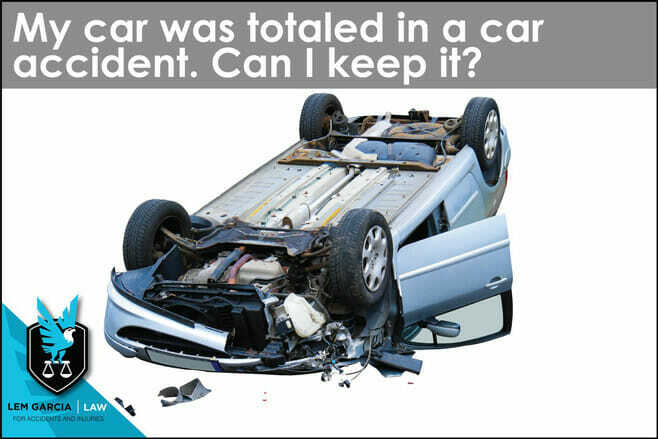 If you decide to keep your car, they will reduce the salvage value of your car from the amount that they owe you. In this situation, if your car is worth $10,000 and the salvage value of your car is $3,000, you can keep the car and the insurance company will pay you $7,000 ($10,000 – $3,000 = $7,000). If you do not own your vehicle and are still making payments on it, they will not allow you to keep your car if there is still a balance after the insurance carrier pays the finance company the value of your car. For example, if you owe $10,000 to the finance company and your vehicle is only worth $5,000, the insurance carrier will pay the finance company $5,000, but you will still have a $5,000 balance. Because there is a balance remaining on the vehicle, they will not allow you to retain your vehicle. It is important to keep in mind that if you decide to retain your vehicle, you will still be responsible for the repairs for your vehicle. In most situations, it is not worth retaining the vehicle and getting paid for the value of the car minus the salvage value of your car. However, there are many situations where this option will be advantageous for you. Every case is different and you will have to decide for yourself what is best for you. West Covina car accident lawyer, Lem Garcia, helps people with their property damage claim if they have been injured in a car accident. Case consultations are always free and without any obligation.